It is with profound sadness that we announce the untimely passing of Donna (Younkin) Logan, a great friend and cousin of all who share Younkin genes. For more than 15 years, from the early 1990s to her death on Jan. 4, 2006, Donna was a pioneering organizer of the National Younkin Reunion and publisher of the Younkin Family News Bulletin. She freely shared her vast resource of research information, always with cheer and enthusiasm. Her latest discoveries were of Younkin-Junghen cousins and connections in Germany, and also the launch of a Younkin DNA project utilizing technology to determine precise bloodlines. Her passing has been a powerful shock, and she will be missed by many. Rest well, friend, and thank you. This website, built with much love, will be maintained in her memory. Click here for photos from recent Younkin Family Reunions at Somerset, PA. Date Calculators from SearchForAncestors.com - both Gregorian and Julian. Photo Information: the above photo is of my grandmother, Virginia Puckett Schafer (right), wife of Howard Raymond Schafer, with her sister Regina Puckett. 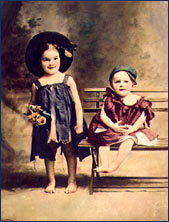 This picture shows that Virginia and Regina's mother had quite a sense of humor to dress her daughters in rags for a professional portrait! Before clicking the SEARCH button please choose a family surname you are interested in. If you don't you will get hits from all of the families.